Prevention of global warming Essay: How can we stop or control Global Warming? 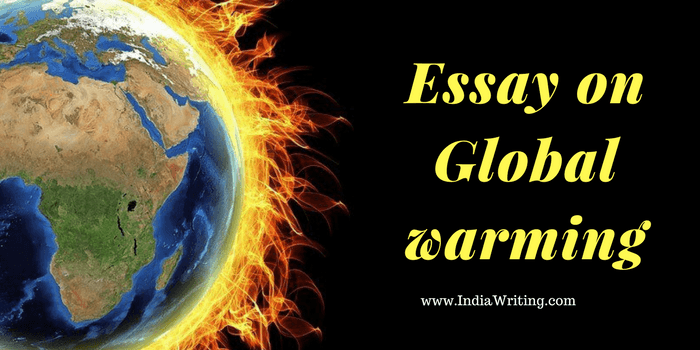 Do you want to write an essay on global warming? Do you want to know the causes and effects of global warming? In today’s era, the definition of environment has or has been changed completely. As the world is getting technologically smarter, the phase of industrialization is growing rapidly. Its a simple mathematics, the more the industries and factory, the more resulting pollution and environmental issues. Among such issues, Global Warming is one of the most serious concerns the world is going to face if not taken seriously. Global warming is the rise in temperature of the earth surface. It is a threat for all of us. The bad effects of it is increasing day by day. The consequences may be high if preventive measures and awareness are not adopted in current situation. In this article, we will understand what is global warming, its causes, consequences and methods of controlling global warming. According to Wikipedia, Global warming also referred to as climate change , is the observed century scale rise in the average temperature of the earth’s climate system and its related effects. Global Warming is the gradual increase in the overall temperature of the earth’s atmosphere, be it land or water. Global warming is a serious concern for all of us. It is the real high time for us to get aware about the serious effects global warming can cause to us if taken easily. Our earth surface s getting hot day by day by the increase in level of carbon dioxide in our atmosphere. We have below presented an essay on global warming for students of all classes. Here, we have discussed the causes, effects, and all preventive measures for global warming & climatic changes rise on earth. This is a essay on Global warming in 1000 words. Please use as it is as your essay or speech on climatic change or shorten it if you need in 300 or 500 words. You can also find more detailed information below this essay so that you can create your own unique essay without copying this one. Global warming has become one of the biggest challenges on the earth today. It happens due to the increase in temperature of the neon surface air on earth. Its impact reaches the biodiversity and causes diverse effects to the climate conditions. Today, the increase in global warming has risen the sea levels. It has melted ice caps and have brought immense changes in the climate conditions. Thus, global warming is a huge threat to the life on earth. From the past century, it is seen that the global temperatures have risen immensely. The science says that the increasing temperature has taken place since the mid-20th century. This was due to the greenhouse gases and pollution created due to human activities. The total temperature has risen by 0.5 degree Celsius throughout the planet. 1990 was the hottest year in the 20th century. The imbalance created on the earth and to the lifecycle of different species has conferred a lot of disasters taking place in the world. These are seen in the form of cyclones, floods, droughts, tsunami, landslides, etc. The carbon dioxide that is the substantial constituent of the environment has spread the effect of global warming throughout the earth’s surface. The heat increases the evaporation of water in the air. The vapour again is a sort of greenhouse gas. Moreover, as more and more vapours are created, the carbon dioxide level in the environment will also rise. The rate at which the disaster rises depends on the natural, economic, technical and social developments that we make. Various other gasses are too responsible for the increasing global warming. The nitrous oxide, CFCs, methane, tropospheric ozone is again responsible for global warming. Global warming has led to melting of glaciers, change in the rainfall pattern, enhanced intensity and frequency of extreme weather conditions. The shrinking of glaciers can cause significant problems of drinking water in the near future. The melting of glaciers is known to evade the presence of these glaciers entirely in the coming 15 to 20 years. It will not only create problems concerning the drinking water but will also destroy food grains towards the north of America. However, India too has been affected to due to shrinking of Himalayan glaciers to about 30% in past 40 – 50 years. While global warming increases the atmospheric temperature, it leads to waterborne and airborne diseases. These diseases are responsible for a large number of deaths. Moreover, global warming leads to draught causing starvation and malnutrition to the humanity. The global warming is thus a threat to the entire flora and fauna present on the earth. The major reasons for global warming are the massive increase in the population growth deforestation, industrial growth, technological advancements, urbanization, etc. The trees play a prominent role in reducing the carbon dioxide. They are the most substantial sections of the environment that take in the carbon dioxide and release oxygen. However, deforestation has led to cut down of trees and thus increase in the global warming. While deforestation holds 25% responsibility of all the carbon dioxide in the air, we’ve ended up cutting down 34 million acres trees every year. A lot of rain forests are destroyed each day. The consequences of the same will obviously cause an increase in the carbon dioxide levels. The levels are known to increase by almost 0.4% every year. Consequently, it has become very imperative to save forests. They are the sole way to absorb maximum carbon dioxide. The population growth again is highly responsible for global warming. A large population living is using technology that is destructive to the earth. Almost 80% of the carbon dioxide is produced due to the humans using fossil fuels in the form of gas, coal, oil, etc. The burning gasoline in the vehicle engines has led to substantial toxins in the air. 30% of the global warming involves the sulphur gas emitted into the environment. Sulphur is again released when we burn fossil fuels. The increasing global temperatures are therefore causing a rise in the sea levels. Another reason why global warming happens is the presence of urbanization. A lot of cities located in the coastal areas are submerged in the sea. However, the increasing sea levels are known to destroy the islands massively. We frequently hear the news of floods which is all because of damage to the life living near the sea. As individuals, we can take up a lot of steps to contribute towards lowering of global warming. One of the major ways is to plant more trees. The trees being the prominent part of the ecosystem that absorbs carbon dioxide, the trees solely can save the entire environment. Do not waste energy. We should use only the amount of energy we require. For example, switch off the lights when not in use. Conservation of electricity and other forms of energy can do a lot good. Spread the word. While we alone cannot eradicate too much of the global warming, it is imperative to speak to the people about it. Tell them how they can save their environment from global warming and natural disasters. We can also make people understand about the rising populations. The government and the private agencies have taken a lot of steps to eradicate global warming. They have been creating awareness about how large population can destroy the environment. Organisations conduct special family planning training for their employees. Moreover, the government has started imposing heavy taxes on the things that cause global warming. This will again contribute to people consuming energy judiciously. Moreover, the technology is now transforming into a natural way of energy consumption with the view to saving the environment. It is better to use natural form of energy that has no side effects. All these measures will definitely contribute stopping global warming. Global warming is a serious threat to the mankind which is directly or indirectly caused by us humans. The practice of continuous cutting down of trees for the use of forest land for any reason or for using the wood of trees in any manner is called deforestation. Deforestation is the mother of pollution, global warming, drought etc. Deforestation in these days is practiced world widely despite of regular warnings and awareness. Plants play an important role in regulating the climate on earth, as they are the agents for absorption of carbon dioxide from earth and release back of oxygen back into the atmosphere. Plants are the main leaders in maintaining the global warming to 1.5°C. When deforestation is practiced, the above settlement fails with the climate and hence global warming increases. Hence, deforestation plays a major role in the rise of global warming. The burning of fossil fuels like coal, oil and gas releases carbon dioxide into the atmosphere. Our level of carbon dioxide pollution per person is nearly double the average of other developed nations. We must gradually practice methods of producing electricity or any other energy in a green manner, rather than using coal and gas for generation of electricity or any other energy. Thus burning of fossil fuels increases the release of carbon dioxide and hence global warming gradually increases. Surprisingly, the sun also plays a significant role in causing global warming. The climate has continuously changing for centuries. The global warming happens because of the natural rotation of sun that changes the intensity of sunlight and moving closer to the earth. Volcanic eruptions are also a major agent of global warming rise. Volcanic eruption results in huge amount of release of carbon dioxide into the earth atmosphere, which results in rise in temperature. The green house traps the solar radiation and stops them from escaping out of the earth atmosphere. Thus, Volcanic eruptions also causes global warming. Green house gases like carbon monoxide and sulphur dioxide trap the solar heat rays preventing it from escaping out of the earth’s atmosphere. This causes a direct rise in temperature of the earth surface leading to global warming. Methane is a green house gas which is more effective in causing global warming than any other green house gas. Methane is nearly 20 times more effective than carbon dioxide in trapping the heat in the earth atmosphere. Hence, methane also causes global warming up to an unimaginable extent. Ozone depletion means the decline of ozone layer over the Antarctica. Ozone layer in atmosphere gives protection to the earth surface by inhibiting harmful radiations from entering the atmosphere. Ozone layer is declining day by day by the increase in release amount of chlorofluorocarbon gas. Chlorofluorocarbon gas is found in refrigerators. Chlorofluorocarbon gas also known as CFC gas are also used as aerosol propellants in different cleaning agents. The release of these gases into the atmosphere gradually depletes the ozone layer of atmosphere leading to ozone depletion which causes global warming. Due to the above few causes, global warming has seen a marked rapid increase these days. Hence, leading to many disastrous effects for the earth ecosystem. Global warming may result in bringing destructive effects on our planet earth. Let us understand some adverse effects global warming can lead to if not prevented. Due to global warming, the earth is getting more and more warmer these days. Global warming has a direct effect on the climatic balance of earth. Global warming increases the earth’s climate gradually, which is a threat for us inhabitants. Another effect global warming brings for us is thai it is responsible for rise in sea level. Global warming leads to temperature rising on earth. The rise of temperature allows melting of glaciers and polar ice which directly flows into the sea. And hence sea level rises drastically which can cause danger at some times. According to the National snow and ice data center report, if the ice melts today, the sea level can rise upto a level 230 feet higher than the current level. Global warming in these days, as observed is effecting human health slowly but in a continuous manner. As global warming rises the earth heat level, it causes several tropical diseases with changing climate. As global warming will result in melting of ice bodies, it will be seen that the species like polar bears will gradually be forced to migrate to other suitable region. Lacking of such suitable region will lead to the rule ‘survival of the fittest’ and the odd species will slowly get extincted. Due to rise in global warming, it is most probable of the occurrence of hurricanes which will lead to huge loss of lives and monetary loss. Hurricanes are the most dangerous effects that global warming can bring to us. As global warming will rise the temperature of earth, it will directly result in drought leading to loss of crop and the unavailability of water. This is one of the most serious effects that global warming can bring to mankind. The droughts of 1998-2002 are highly anomalous and consistent with global warming caused by emission of green house gases. Global warming has a direct link to the change in terrestrial and aquatic ecosystem leaving them completely in dry state. This results in migration of species from one region to another in search of suitable habitat. This results in decline in number of species sometimes. Global warming also effects yield of food by effecting crops directly by giving space to drought. Due to global warming, several factors like temperature and moisture impact the plant species to survive, thus leading in loss of crop yield figures effecting agricultural production. Global warming is a serious topic to be discussed at the earliest. It has adverse effects on our life. We must ensure prevention or control of global warming immediately. There are many ways to stop global warming from effecting our life. In order to control global warming, we must make our all possible less contribution to green house gases. This can be done by reducing the usage of gasoline, petrol etc. and adopt eco friendly energy to meet our daily lifestyle requirements. To this reply, we must practice the usage of electric vehicles for instance. In order to bring a limit on growing global warming, we all must follow the rule of 3R. 3R means Reduce, recycle and renew. We must in our daily life, to its fullest possible use recycled products, follow use of renewable segment (like renewable energy) and reduce usage of un-ecofriendly products in our daily life. This practice will bring down the production in industries, emit less carbon dioxide to the atmosphere, which will gradually result in decrease in level of global warming. We must strictly practice afforestation. Afforestation is the habit of planting more and more plants and ensuring zero cut down of trees. Plants play an important role in regulating the climatic factors of our ecosystem. Plants bring rainfall to the earth and absorb carbon dioxide and release oxygen to the atmosphere. Thus decreasing the level of presence of carbon dioxide in our atmosphere, resulting in control of global warming. Hence afforestation should be rapidly practiced. We must ensure that our society is well learned about the adverse effects of global warming. We must in our possible way create awareness among people teaching them not to use UV or CFC emitting sources. This awareness can be done by spreading our views on global warming on social medias also. We can reduce global warming up to a certain extent by switching to renewable sources of energy in our homes and offices. We can adopt use of solar panels for electricity generation. We can adopt eco-friendly energies for our needs. We can contribute a lot to our environment by using energy efficient appliances in our homes and work stations. For instance, we can use LED lights instead of the age old technology, saving our electricity. we should ensure that we only purchase energy saving appliances by inspecting product reviews and the star rating of products. Global warming is a threatening to the nature and a serious warning of its effects if not prevented in time. We as citizens, must contribute to our fullest in reducing the ways that evolves global warming. We should plant more and more plants around us to maximize the presence of oxygen in atmosphere and minimize the level of carbon dioxide in atmosphere. So,its time for us to swear that our activities will in no way give space to global warming and we will take possible steps to reduce global warming in our planet earth. If you have any views or suggestions on our global warming essay for children, then please feel free to comment on our comment section below the post, so that we can have a discussion on this serious topic and find more ideas for reducing global warming. Please tell us how helpful was our essay on global warming for you.